Walking at night, living alone … many people are afraid of being attacked in these situations. And with good reason: More than half of us will be the target of violent crime in our lifetimes. In fact, we are most vulnerable with people we know: More than 70% of attacks on women, girls, LGBTQ and gender non-conforming people are by acquaintances, friends, partners (& ex-partners), and family members. Know what matters. Would you fight over your watch, your purse, your car? Chances of injury are high, and no property matters that much. But what about protecting yourself? 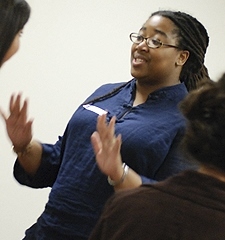 Those who set limits against abuse, or resist sexual assault, are less likely to be injured. Practice awareness. Notice people, their moods, their behavior. Notice how they treat you. Keep track of your environment, where the nearest way out or safe place is. If you’re distracted, or just inside your own head, you’re vulnerable to surprise. Awareness is the first line of defense. Learn to say no. Attackers rarely strike out of nowhere. Usually they are someone you know, and they have pushed your limits or violated your boundaries already. If youre uncomfortable, say so. Pick your friends and partners wisely. If someone puts you down, tries to control you, disregards your opinion, or refuses to take no for an answer, ditch them. These are warning signs of abuse. Take them seriously. Use your tools. Even if you are small, out of shape, or have disabilities, you have options against an attacker. Yell: NO! Leave me alone! Call 911! Stomp the attackers feet, kick knees or shins, drive your knee into their groin, poke their eyes, smash their nose. 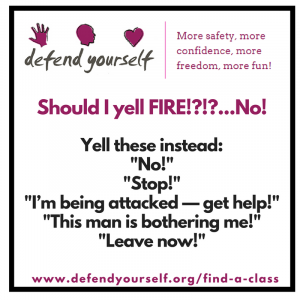 For practice on all these things, and lots more skills,take an empowerment self-defense class! For a printable pdf of this handout, click here. 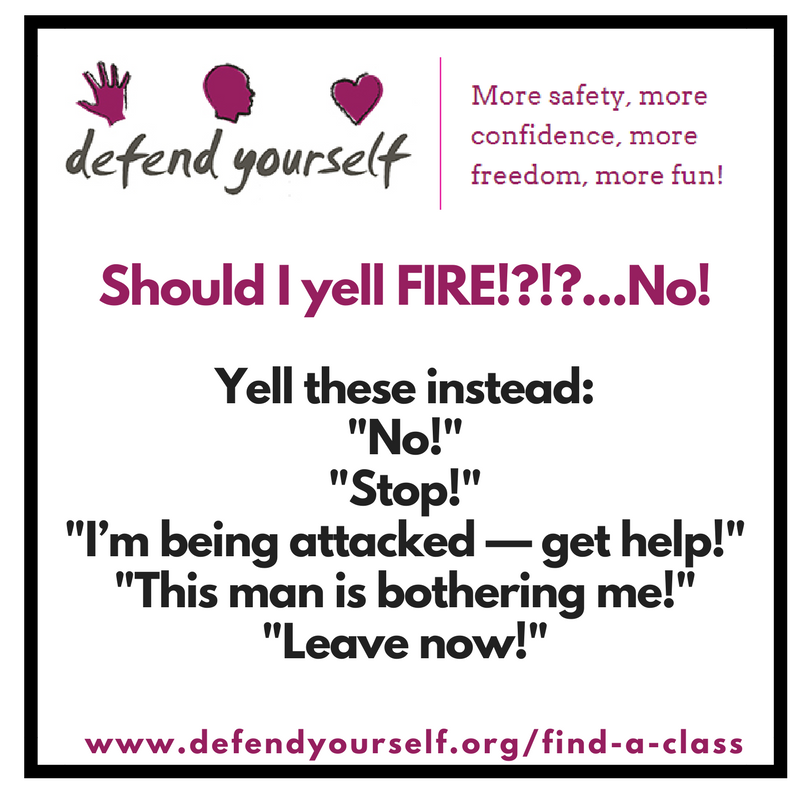 Lots of people have heard that if they are attacked they should yell “fire” to help attract attention. I don’t agree. Why am I not onboard with the “yell fire” advice? First, remember that some 70% of attacks on women and teen girls are by people we know. We’re most likely to be attacked on familiar ground: our homes, the homes of our attackers, school, work, social situations, etc. So we’re generally inside. If you’re in a building and yell fire, most people will run outside, not run to the fire. So yelling fire can send help away. Of course I’m not opposed to anything that works! (And almost anything might work sometimes.) The most important thing is to yell — and yell loudly. This season, many of us have to (or choose to) eat a meal or spend time with someone who disrespects us or with whom we strongly disagree. Some of us even are sitting with someone who has abused us. Below you’ll find some ideas for getting through — or maybe even enjoying — your time. You are allowed to not go. You are allowed to stay home and do the thing you love the most, or even something that’s kind of meh. You are allowed to go and stay a short time. You are allowed to go and then leave if someone crosses a line. (It’s a good idea to decide before you go what and where your lines are.) You can leave even if it’s your house! You are allowed to go and to take breaks (help in the kitchen, play with the kids, make a phone call, take a walk, put on a movie, read a book). Breaks are really good for your nervous system. You are allowed to set limits (for example: “I won’t listen to any conversation that puts a group of people down. If someone does that, I’ll point it out and if they don’t stop I’ll leave.” Or “I will not discuss my love life or my weight or my ….” You get the idea). Change the subject: Aunt Wilhelmina, Nephew Charlie was telling me about your garden. What was the new plant you put in? or Cousin Trumpishness, I love your shoes! Where did you get them? or Cookperson, this stuffing is amazing. What did you put in it? or Tell me what Youngest Child is into these days. Focus on hospitality: I really appreciate the time you spent putting this meal together… the warm day… the snowy day … the yummy Jell-O mold … the new family member … the traditions … your love despite your differences (only if there is any) … your memories of a good time you once had together … your mutual love of Game of Thrones. Ask questions: Irrelevant ones (Tell me again about how our family moved Here from There in the 1920s) or relevant ones: So you think Brett Kavanaugh’s life was ruined? Do you think there should be any consequences for what he did? Oh, you don’t believe Christine Blasey Ford? How did you decide not to believe her? Are there people who have reported sexual abuse who you have believed? What was the difference in that situation? This Q and A can take up a lot of time. Ignore the attack: If someone is trying to bait you into an argument, act as if it’s a friendly conversation. (“Well that’s an interesting point of view. How was your day/trip/meal?”) Also, avoid pushing anyone else’s buttons. Not worth it. Get mindful: Tune out what’s going on for a few seconds, a minute, or 20. 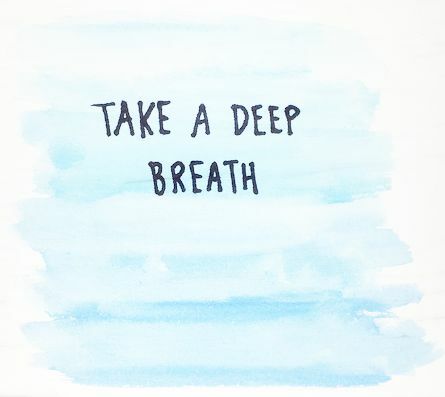 Take some breaths and NOTICE them. Feel your feet on the floor. Feel the feelings in your body and just be with them. Accept them for the moment don’t try to change them. Remind yourself: These people are not my people. I have friends and support other places. This is just one day. I can get through it with minimum damage. You can even chant quietly to yourself “This is not my life. This is not my life. This is not my life.” Remember the things that make you happy: Your partner, your dog, your job, your favorite show… whatever it is. You’ll be back to them soon. While it’s powerful to engage in conversations about racism, sexism, immigration, LGBTQ rights and more, remember that you may not be able to change people’s minds — and certainly not in one sitting. Most of all, keep yourself safe, both physically and emotionally. If something threatens your (physical or emotional) safety, leave, use your words, or get help. Over the next couple of weeks, many of us have to (or choose to) sit and break bread with someone who disrespects us or with whom we strongly disagree. Some of us even are sitting with someone who has abused us. Below you’ll find some ideas for getting through or maybe even enjoying your time. You are allowed to not go. You are allowed to stay home and do the thing you love the most, or even something thats kind of meh. You are allowed to set limits (for example: I won’t listen to any conversation that puts a group of people down. If someone does that, I’ll point it out and if they don’t stop I’ll leave or I will not discuss my love life or my weight or my … you get the idea). Focus on gratitude: I really appreciate your hospitality the time you spent putting this meal together… the warm day… the snowy day … the yummy Jell-O mold … the new family member … the traditions … football … your love despite your differences (only if there is any) … your memories of a good time you once had together … your mutual love of Game of Thrones. Ask questions: Irrelevant ones (Tell me again about how our family moved Here from There in the 1920s) or relevant ones: So you think AlabamaChildAbuser should have gotten the seat. Do you think there should be any consequences for what he did? Oh, you don’t believe the women? How did you decide not to believe them? Are there people who have reported sexual abuse who you have believed? What was the difference in that situation? This can take up a lot of time. Ignore the attack: If someone is trying to bait you into an argument, act as if it’s a friendly conversation. (Well that’s an interesting point of view. How was your day/trip/meal?) Also, avoid pushing anyone else’s buttons. Not worth it. Remind yourself: These people are not my people. I have friends and support other places. This is just one day. I can get through it with minimum damage. You can even chant quietly to yourself “This is not my life. This is not my life. This is not my life.” Remember the things that make you happy: Your partner, your dog, your job, your favorite show whatever it is. You’ll be back to them soon. While it’s powerful to engage in conversations about racism, sexism, immigration, LGBTQ rights and more, remember that it’s not your job to change people’s minds — and certainly not in one sitting. Most of all, keep yourself safe, both physically and emotionally. If something threatens your safety, leave, use your words, or get help. Inspiring, caring, understanding, strong, and self-assured.